Blues' Golden Ale- A mellow, yet refreshing golden ale with balanced layers of flavor. The crisp and clean finish of Blues’ Golden Ale makes it the perfect complement to any meal. 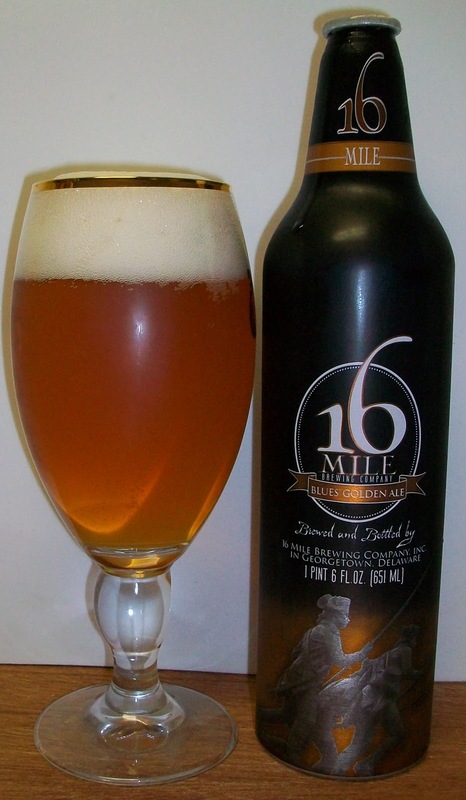 16 Mile names this golden ale for The Delaware Blues who fought in almost every battle of the Revolutionary War. A monument in their honor is located Outside of Legislative Hall in Dover, Delaware. The beer pours a clear golden yellow with copper hues and a bright white head. The beer is highly carbonated with lots of tiny bubbles rising up from the bottom of the glass. The nose is pleasant with light pilsner type malt aromas and with a gentle swirl a sweet floral hop notes are released. This nose seems like it would be a very refreshing beer, how inviting. Well, that first sip was so carbonated that I really did not pick up much of anything just a slight light malt sweetness. Humm, I’m not too sure about this one. There is very little of any flavor up front. There is a tingling effervescence over the tongue in the middle of the sip. The back-end seems to have an odd malt flavor during the swallow. That is contrary to the carbonation release that is also during the swallow. The finish is just not very good. There is an odd off flavor in the finish that is very unpleasant. This carries into the final aftertaste as well. It’s funny that the first few sips seemed pretty good. But the off flavors seem to be getting stronger and stronger as I drink this beer. Odd this is almost like an adjunct. We are only at 63 degrees and this beer is picking up a metallic aftertaste. Man, this is actually getting hard to drink. I did finish this 22oz bottle but it was not very enjoyable. This is a D+ to C- for me. I really expected a better beer. It was pretty drinkable at first but as this warmed it just got worse. It quickly developed off flavors and a metallic aftertaste.